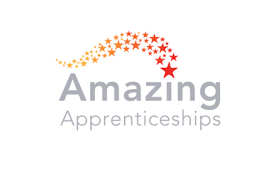 Want to know more about the exciting apprenticeship opportunities at Electricity North West? This live event focussed on the apprenticeship programme at Electricity North West. The live broadcast featured some apprentices and a recruiter who shared their stories and provided advice on the application process. We own and operate the North West’s electricity distribution network. Our priority is the safe and reliable distribution of electricity to the region’s 2.4 million properties. We’re investing more than £1.9bn in the next eight years to improve and maintain the network. The way we use electricity is changing, and as demand grows, our network needs to become smarter. We want to work with all our stakeholders to deliver the network you need. 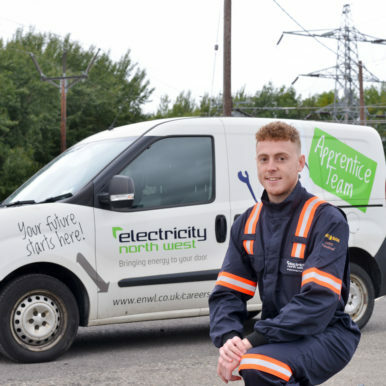 Chris heads up Electricity North West’s apprenticeship scheme and is responsible for creating, developing and implementing the apprenticeship programme. This includes supporting recruitment and day-to-day management and support for apprentices and their managers. 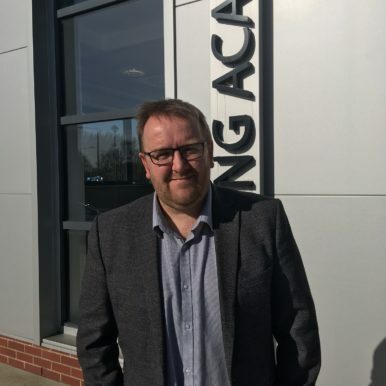 Chris enjoys welcoming new apprentices to the business, seeing the enthusiasm and excitement they have as they start their careers at the company through to seeing them complete their studies after three years of training and development. Chris describes Electricity North West as a fast paced and innovative organisation to work for, with apprentices playing a key role in the future of the business- something which he is extremely proud of. Nicole applied for our apprenticeship scheme so she could learn new things every day, meet new people and travel across the North West as part of her job. She enjoys working for Electricity North West as they have lots of benefits and get involved in various local community and charity projects and describes the most rewarding part of her job as helping customers when they really need it, such as during a power cut. 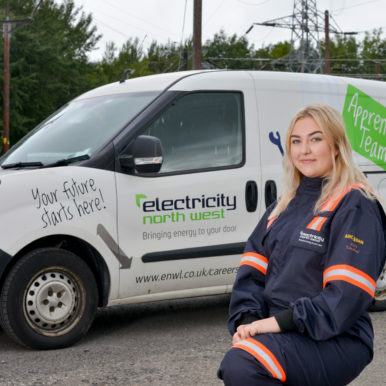 Nicole hopes to one day become a trainer at Electricity North West’s Training Academy, helping future apprentices. Our apprenticeship scheme appealed to Luke because it offers a good balance of theory and hands on experience within the electricity industry and a competitive salary whilst you’re studying. Working in challenging weather conditions such as high winds, rain and snow is one of the biggest things he’s had to overcome so far but with a good team around him the job always gets done to the highest and safest standard. Luke is hoping to complete his training and become a cable jointer before progressing to become an engineer. He’d recommend applying for the scheme as you get lots of onsite experience and Electricity North West support you with your future career at the company. Sam is one of our Higher Level Apprentices who joined us because he felt it was the best way to get into the industry- studying and working in one place. 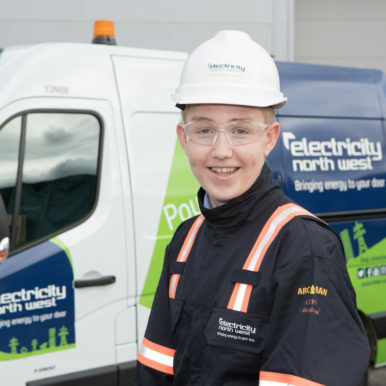 He enjoys working with other apprentices and describes the environment at Electricity North West as having a real family feel to it. Sam is proud to work for a company who make a huge difference to the community around it and hopes to continue his career at the company once he’s finished his training. After completing a BTEC Level 3 in Electrical and Electronic engineering, Callum decided to apply for the apprenticeship scheme so he could gain hands on experience within the industry whilst studying for his Higher National Certificate (HNC) in Electrical Engineering. Callum enjoys the forward thinking approach the company take; always putting safety at the top of everything they do with high quality trainers and facilities on hand to support him in his role. 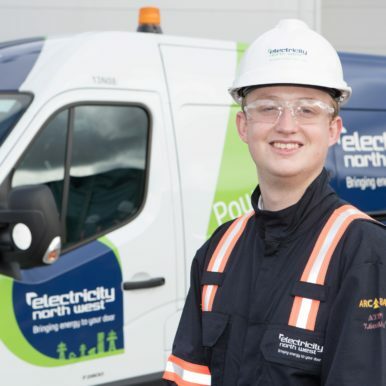 Callum enjoys everything about working for Electricity North West, from the support he gets from the company to making a difference to the local community and hopes to continue his career with the company once he’s completed his studies.